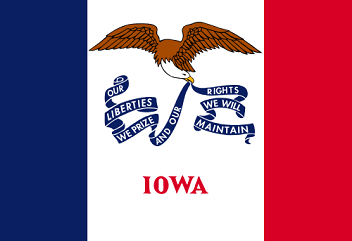 The State Flag of Iowa features an image of an eagle holding a banner with the words of the state motto in its beak. The horizontal bars of red, white and blue represent revolution and freedom. The flag serves as a symbol of honor, heritage and regional pride and is displayed at state buildings. There is a strict Order of Precedence for flags. State Flags are displayed in order as they entered the Union. Car Flags are often displayed to represent of an individual's allegiance to their state. Iowa State car flags are used by their owners as mobile emblems of their home. Car flags are usually made from strong materials and are attached to a car via a pole and clip window attachment. What is the design of the Iowa state flag? The design is vertical tricolor flag consisting of white, red and blue. The center stripe depicts an eagle holding a ribbon with the words of the state motto. What does the eagle symbolize? In heraldry the eagle was a symbol held by men of action and ingenuity, occupied with weighty affairs. The eagle was intended to at once to recall the great Roman Republic and at the same time be uniquely American (the Bald Eagle being indigenous to North America). The American Bald eagle is depicted with its wings "displayed" which is a symbol of protection. Who designed the Iowa State Flag? What is the history of the Iowa State Flag? The image of the bald eagle symbolized Iowa’s integration within the United States of America. The Iowa flag is kept and used as required by the code specified in the constitution of the state. Iowa Official Nickname "Hawkeye State"